That’s No Personal Locator Beacon! When is a Personal Locator Beacon not a PLB? 406 MHz Personal Locator Beacons (PLBs) are earning a well-deserved reputation for saving lives. These personal-sized distress beacons (large pocket sized) use the same technology that’s been used in marine and aviation (EPIRBs and ELTs) for many years and saved thousands of lives. If you’re headed out into the backcountry, especially if solo, you should be carrying a PLB. Recently, a new product introduction has led to confusion regarding PLBs. Let’s clear up the confusion. Since 1990 the international COSPAS-SARSAT search and rescue organization has been using the term Personal Locator Beacon in official internationally recognized published documents to describe this distress beacon and regulate its minimum performance. When activated, PLBs transmit a 5-watt digital signal to two types of satellites that are part of the COSPAS-SARSAT search and rescue system. Low Earth Orbiting satellites use Doppler technology to provide search and rescue (SAR) a distress alert (in other words, notification that you need help) and your location in no more than 90 minutes anywhere in the world and generally within 45 minutes in North America. Between 70 degrees north and south latitudes (which covers most of North and South America, for example) they also transmit to Geostationary satellites orbiting 22,300 miles up over the equator, providing a distress alert within just 3-5 minutes. If equipped with GPS, and most PLBs sold today are GPS equipped, they can also provide your location as well, again in just 3-5 minutes. Free registration that includes emergency contacts allows SAR to quickly confirm if the distress alert is real and often provides additional useful information to those coming to rescue you. PLBs function worldwide, they can be used as easily in Africa or Antarctica as in Arizona or Alaska (though the actual rescue may take longer in some places than others). Location accuracy is within 2 miles for a Doppler position and within 100 yards for a GPS enhanced position. In real life, even with just the Doppler position responders to 406 MHz beacon alerts often fly to the location provided and immediately locate the survivors within view. PLBs are also equipped with a lower powered 50 milliwatt 121.5 MHz homing beacon that can be used for final location if necessary. This is the standard distress homing frequency used worldwide and SAR operators are equipped and trained to use sophisticated direction finding (DF) receivers that operate on this frequency. 406 MHz DF equipment with even better performance is also now being fielded. The 406 beacon community likes to say that 406 MHz distress beacons take the “search” out of “Search and Rescue.” That equates to more lives saved. Click here for an overview of how the COSPAS-SARSAT system works. The 5-watt PLB distress signal is strong enough to penetrate even the heaviest forest canopy and has been shown to work even in deep narrow canyons and similar challenging terrain. PLBs are waterproof and abuse resistant. 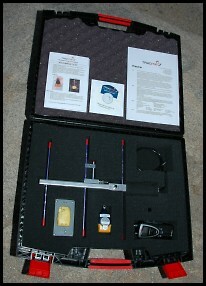 The current generation PLBs weigh less than 10 ounces and cost about $650 with GPS. Previous generation PLBs, which weigh 12-14 ounces, cost from $450 – $550, without or with GPS, respectively. 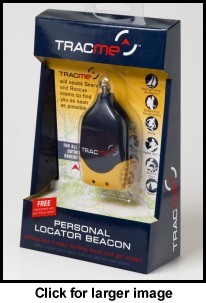 The recently introduced “TracMe Personal Locator Beacon” is only $150 and weighs just 1.6 ounces. It is so small it could fit on your keychain. Because the manufacturer (TracMe Beacons Pty Ltd of Australia) is using the same PLB nomenclature, you might be tempted to believe it has similar capabilities to a real PLB, and given the lower price, weight and size, be tempted to purchase it as a distress beacon. Don’t! A distress beacon that doesn’t notify someone you are in distress and provide location information is no distress beacon. TracMe is simply a homing beacon, nothing more. The TracMe operates on FRS (Family Radio Service) channel 1. Yes, the same FRS frequency as used by those ubiquitous inexpensive “walkie-talkies” you see at Wal-Mart, Cabela’s and elsewhere. Once someone comes looking for you, the idea is that the TracMe device will allow SAR to locate you by homing on the transmission. Since virtually no one in the country is currently equipped to do so, and it requires a significant expenditure to buy the specialized DF equipment, as well as time and effort to train how to use it, you certainly can’t count on this capability anytime real soon. So, even with TracMe offering their DF kit (image right) on loan for training, that’s at best only a start and it’s a big country out there. It’s a classic chicken or egg situation. The TracMe transmits at “less than 10 mW” (compared to 500 mW for an FRS radio), so range is very limited. TracMe claim 5 miles, but that is under ideal conditions, and supposedly 20 miles with “specialist DF equipment” in an aircraft (look for a full report on ETS soon, but probably not until after the Outdoor Retailer show next week). FRS is line of sight so in even moderately difficult terrain, it is easily blocked. If you’ve ever used FRS radios, even with their 50 times more powerful transmitter, you understand the limitations. The search team requires a pretty good idea where to come looking for you in the first place, or they don’t stand a chance, and neither will you. If direction finding equipment is not available, the likely scenario at least in the near term, the only other way to locate you is to box your position with FRS radios and then look towards the center of the plotted locations. In other words, SAR crews have to find the limits of reception of the signal in multiple directions and mark that on a map. That can be time consuming and difficult in anything but unchallenging terrain. Using an aircraft when one is available, this method can more easily cover larger areas to narrow the search area. This is all better than nothing, but a far sight less effective and more time consuming than DFing the signal. TracMe explains the limitations and does state that it isn’t a 406 MHz PLB, but that doesn’t mean everyone will read the “fine print” or understand it. This is not only true of consumers, but also of retail salespersons who may not be adequately trained or who are more interested in making a sale. There are significant concerns in the SAR community, including the responders and providers, not just manufacturers of 406 MHz PLBs; that people will purchase this so-called Personal Locator Beacon believing that it provides the considerable capability of a real 406 MHz PLB. That could end up killing someone. They have expressed their concerns to TracMe and TracMe have chosen to disregard their concerns. TracMe feel that their disclaimers adequately address this. However, TracMe also says in their literature and on their web site that TracME is “suitable for” (among others listed): Yachting, Boating, Fishing, Kayaking, Canoeing, Climbing, General aviation, Outback 4 wheel driving and “all outdoor adventure activities“. Oh, really? The seriousness of this issue was brought home to me as the result of recent emails enquiring about this so-called PLB for uses that would only be appropriate for a 406 MHz PLB. However, most consumers are not going to be writing me for advice. There is definitely already confusion out there, and TracMe is just barely starting to ramp up their marketing efforts. Whether or not the TracMe device is a viable and effective solution for locating people who are lost or in distress is an entirely separate issue which has yet to be determined (look for a full report on ETS soon, but probably not until after the Outdoor Retailer show next week). TracMe may well have a place in the effort to save lives, however, it should be obvious after this brief comparison that it is not a PLB in the sense of the widely accepted use of the term in either the SAR community or the public at large. This is not the PLB that we have come to know as a result of recent rescues and considerable news coverage. Bottom line is that a real 406 MHz PLB alerts authorities that you need help, tells them where you are and also tells them who you are. The TracMe does none of that. A true PLB, in my opinion and that of most SAR authorities, provides satellite distress alerting and inherent location capability that really can save your life. 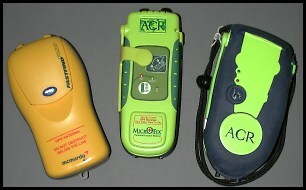 TracMe says, “most simply, we call it that because it is – using ordinary English – an accurate and precise description…Our lawyers and trademark offices around the world have called the phrase personal locator beacon a generic description of the device.” It is possible that it is, indeed, entirely legal, COSPAS-SARSAT wasn’t prescient enough to trademark the term, but is it ethical? Call me cynical, but in my opinion there’s really only one logical explanation for TracMe to have chosen to call their device a PLB. They could have used any number of equally descriptive and marketable names. However, then they wouldn’t have benefited from all the publicity that PLBs have received and will likely continue to receive. In any case, the important point is that as they escalate their marketing efforts you should not be confused by TracMe’s misleading, in my opinion, use of “Personal Locator Beacon;” caveat emptor. Follow-on Blog entry: TracMe: Curiouser and Curiouser – FCC to TracMe: It’s NOT a PLB! That’s No Personal Locator Beacon! was written on August 2, 2007 and filed in Gear, Musings, News, Survival Related Musings.